Charles Cohan initially studied art at the University of Washington where he enrolled in his first printmaking courses taught by Seattle printmakers Bill Ritchie and Glen Alps in 1981. He received a BFA in Printmaking in 1985 from California College of Arts and Crafts under the direction of Charles Gill in lithography and Malaquias Montoya in screenprinting. He graduated with an MFA in Printmaking from Cranbrook Academy of Art in 1988 under the mentorship of Steve Murakishi. Working at Semrau Graphics in Berkeley, CA as a production screen printer during his undergraduate studies at CCAC, he subsequently printed for students in the graphic design program at Cranbrook during graduate school. Throughout his latter academic studies he worked for master lithographer Kent Lovelace at Stone Press Editions in Seattle, most notably as assistant printer for the production of two editions by artist Jacob Lawrence. He printed for legendary lithographer William Walmsley in Tallahassee, FL through the early nineties. Prior to teaching at the University of Hawaii at Manoa, Cohan was on faculty at Florida State University and the University of Wisconsin-Milwaukee. He is currently the curator of the print collection of the Pilchuck Glass School, coordinator of the collaborative printing venture Arm and Roller Press, and co-founder/director of the experimental printmaking group Lithopixel Refactory Collective [LRC]. 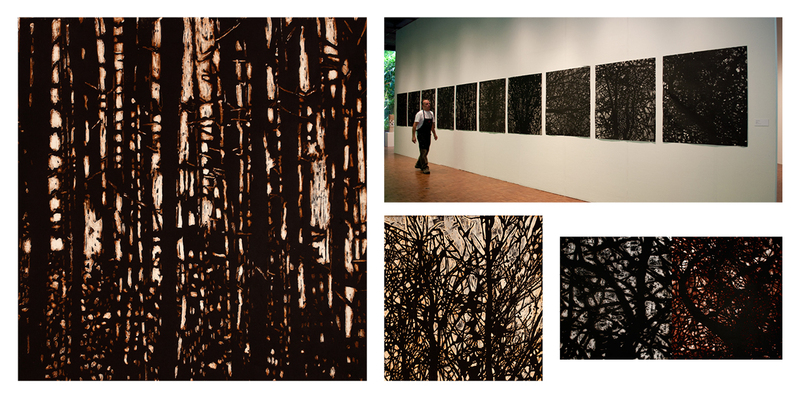 Solo exhibitions since 2000 include Andrew Rose (Honolulu), Curators Office (Washington DC), Pyramid Atlantic (Maryland), Art link Gallery (Seoul, Korea), the Biennial of Hawaii Artists at The Contemporary Museum (Honolulu), 1708 Gallery (Richmond, Virginia), and the Contemporary Museum at First Hawaiian Center (Honolulu). Selected works have been presented in the NEXT Chicago, Scope New York, and Scope Miami/Art Basel Miami Beach international art fairs. Reviews of solo exhibitions have been published in The Washington Post, Art Papers, Washington City Paper, National Geographic Intelligent Traveler, The Concord Monitor, Urbancode Magazine, DCArtnews, and the Richmond Times Dispatch. Teaching residencies since 2000 include the Whanganui Polytechnic in New Zealand, the University of Georgia Study Abroad Program in Italy, the Pilchuck Glass School, Rochester Institute of Technology, Pyramid Atlantic Arts Center, Anderson Ranch Arts Center, Canberra Glassworks and Megalo Print Studio, and the University of South Australia. Awards include a U.S.
Department of State Artist in Residency Research Grant for travel to Havana, Cuba, the commission of an installation in the Terminal 2 building at the Raleigh/Durham International Airport, and a travel and research grant from the Helpmann Academy in Adelaide, Australia.